Scientists at the University of Wisconsin–Madison have looked into graphene-based microelectrocorticography (uECoG) arrays, used in neuroscience researcher, searching for possibilities to expand the use of the arrays in areas such as the research of stroke or epilepsy. Researchers at the University of Wisconsin-Milwaukee, Medtronic PLC Neuromodulation, the University of Washington, and Mahidol University in Bangkok, Thailand were also involved in this study. The researchers see graphene as one of the most promising candidates for transparent neural electrodes, because the material has a UV to IR transparency of more than 90%, in addition to its high electrical and thermal conductivity, flexibility, and biocompatibility. That allows for simultaneous high-resolution imaging and optogenetic control, according to the team. 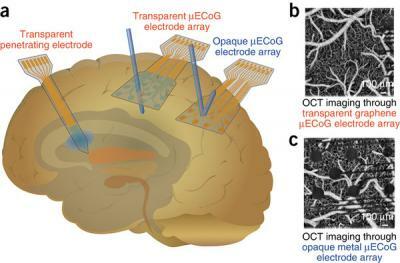 The procedures in the study describe a graphene uECoG electrode array implanted on the surface of the cerebral cortex. This protocol “may be amenable to fabrication and testing of a multitude of other electrode arrays used in biological research, such as penetrating neural electrode arrays to study deep brain, nerve cuffs that are used to interface with the peripheral nervous system (PNS), or devices that interface with the muscular system,” the team adds. In January 2016, An interdisciplinary team demonstrated how to interface graphene with neurons, or nerve cells, while maintaining their integrity. This work may enable building graphene-based electrodes that can be safely implanted in the brain, offering promise for the restoration of sensory functions for amputee or paralysed patients, or for individuals with motor disorders such as epilepsy or Parkinson’s disease. In May 2016, A study coordinated by the International School for Advanced Studies in Trieste (SISSA) and the University of Trieste examined how effective graphene oxide flakes are at interfering with excitatory synapses, which could prove useful in new treatments for diseases like epilepsy.